For years, I have titled this image “Elevala Woman”. The power of social media and Kickstarter is amazing. During the expedition some 9 years ago, I had the privilege of photographing a special celebration (sing-sing) celebrating the 25th anniversary of Father Michael Igo’s ordination. 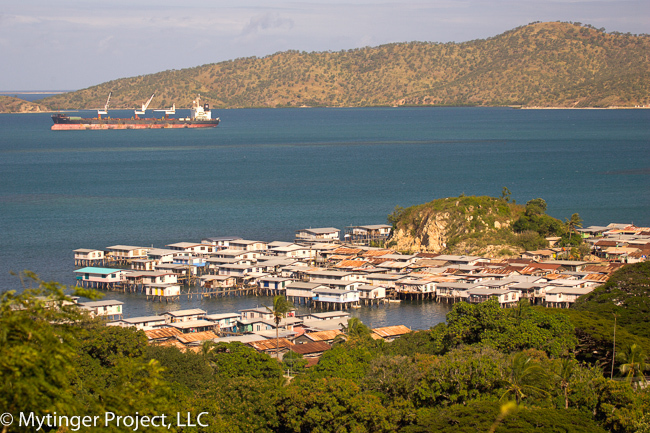 It was held in the area of Hanuabada and Elevala, two distinct stilt villages just outside of Port Moresby, Papua New Guinea. 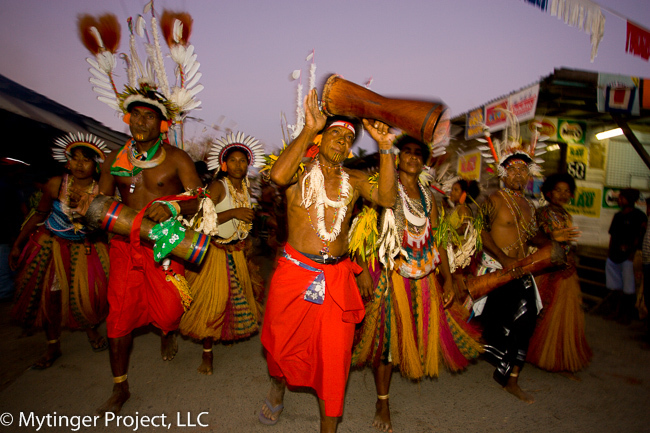 For three days, people from all over came to sing, dance and celebrate. I saw this stunning woman from a distance and photographed her as she stopped and looked directly into my camera. I was able to quickly share the image with her on the back of my camera but then she vanished into the crowd — never to be seen again. I did not know her name nor where she was from. She was titled “Elevala Woman” because that is where I photographed her. Through all the publicity during Kickstarter, I was contacted by a woman who said “This is my aunt!” How exciting for me to now know her name, Leontine Taita Veata, and that she has 4 children. It was explained to me that when a woman marries into another clan, they become a part of it and she is part of the Upi Kupuna clan from the village of Kairuku. 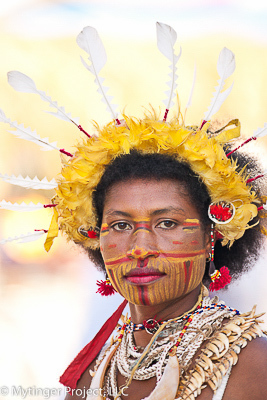 Leontine is now “Kairuku Woman”, the village where she is from. As I think about the new discovery, I remember the thrill of meeting descendants of Caroline’s paintings. Now I celebrate finding the person in my photo and her children and look forward to a day I hand them all prints as tribute to a beautiful woman. Leontine’s portrait is has also become art that spans oceans and decades. For all of my Kickstarter Backers receiving a print of Leontine, I will also include a printed caption of who this stunning woman really is — a PERSON, not just a subject. Headhunt Revisited Raises over $37,000 on Kickstarter! Our Backers are global – Australia, United Kingdom, Papua New Guinea, North America, the Caribbean and even Africa. Thanks to this campaign, Caroline’s story now has a world stage. I seriously cannot express how thankful I am to each and every one of you for sticking by us during this campaign. It truly takes a village to make a documentary film. Our first priority is to edit a work-in-progress, prepare detailed proposals for upcoming grants and plan for pick-up shoots with our experts, like Dr. Joshua Bell of Smithsonian Institute, and Jeffry during the “One World, Two Visions” exhibition. If it wasn’t for the kind and generous support of our backers, the goal could not have been reached. I am honored to have you with me on this journey. As they say in Papua New Guinea – TENKYU TRU! has been working as the story consultant for the documentary film. 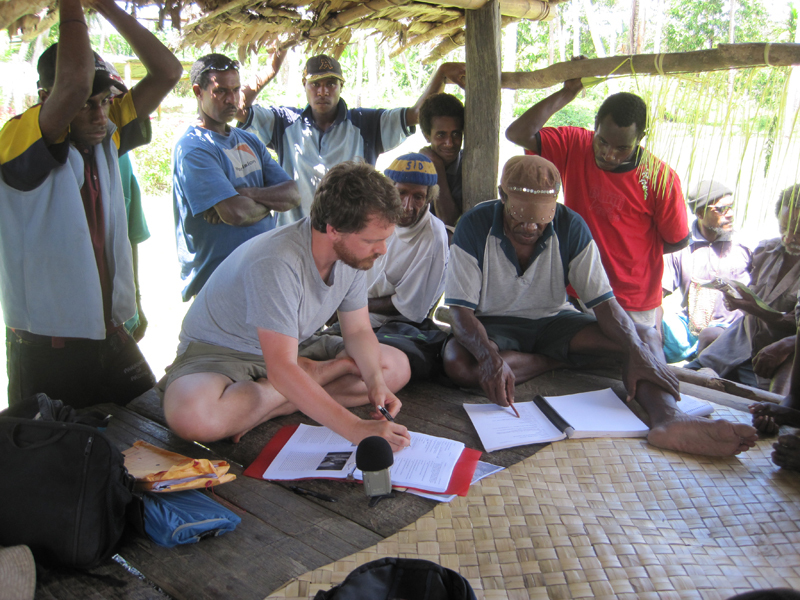 focused on documenting transformations in the Purari Delta of Papua New Guinea. We are pleased to announce the association of Kimberlee Bassford as Producer for the documentary film now in post-production. Kimberlee Bassford is an independent documentary filmmaker born and raised in Hawai‘i with a passion for social issue, cultural and women’s stories. She produced, directed, wrote and co-edited PATSY MINK: AHEAD OF THE MAJORITY (2008), a one-hour documentary about the late U.S. Representative Patsy Mink, the first woman of color in Congress and co-author of the landmark Title IX gender equity legislation. The film premiered at the Hawai’I International Film Festival and won the Audience Award for Favorite Documentary. In addition, the film received awards at other notable film festivals and aired nationally on PBS. She is currently in post-production on the documentary TESHYA RISING, about a teenage female judo and wrestling female phenomenon from Hawai‘i with world championship aspirations. The film has funding from Pacific Islanders in Communications and fiscal sponsorship through Women Make Movies. 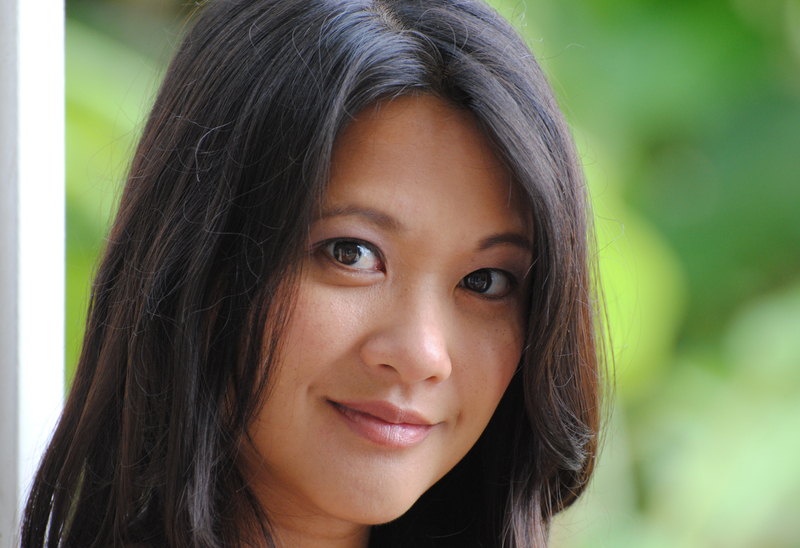 Kimberlee is a graduate of Punahou School and holds a BA in psychology from Harvard University and a Masters of Journalism from the University of California Berkeley. She owns Making Waves Films LLC, a documentary production company in Honolulu, and is an adjunct lecturer at the Academy for Creative Media at the University of Hawai‘i at Manoa. 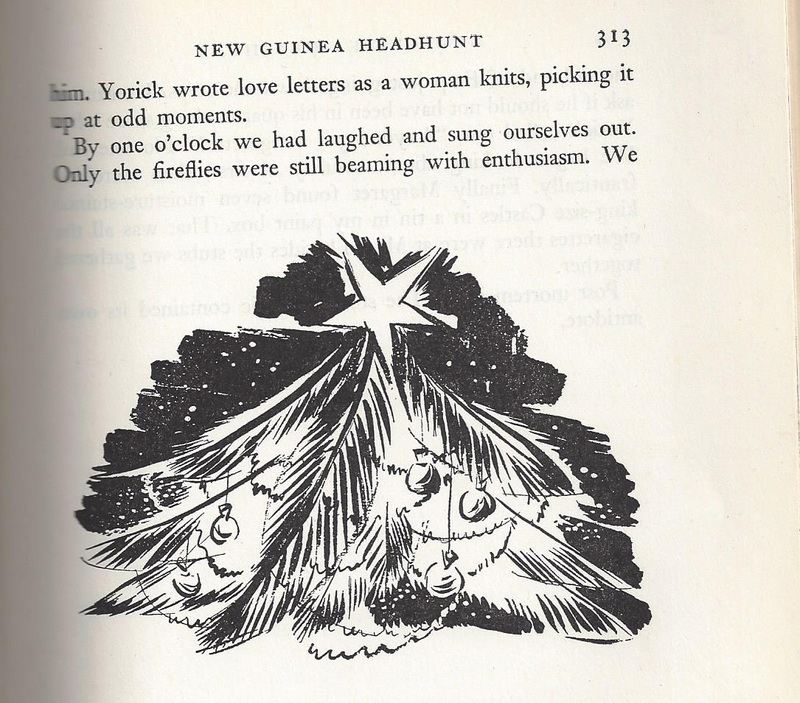 Sketch from Caroline’s book “New Guinea Headhunt” of the upside-down palmetto used as a Christmas tree. A wonderful and whimsical drawing from Caroline’s journal of sketches from the expedition. Best wishes for the Holiday Season and remember Caroline’s words to live life wherever you are. I met Eddie at Icarus Music during the incredible Blue Ocean Film Festival in Monterey, CA over a year ago. He has contributed his talent for composing music in significant films over the years on marine conservation – and many other memorable topics. It wasn’t until a couple of months ago when I received a call from him about Headhunt Revisited. His enthusiasm about the story was engaging. With experience composing World music for a number of Independent Documentary’s, I can’t wait to hear what Icarus Music will put together to accompany Caroline’s story! 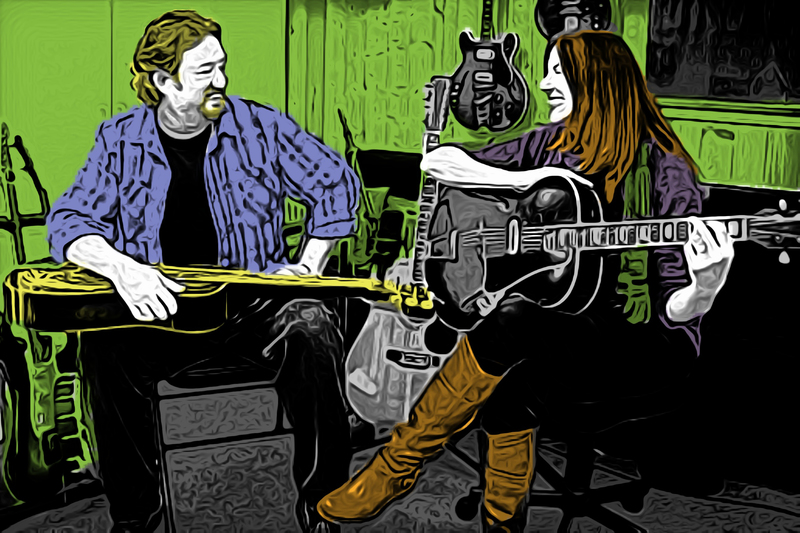 The successful partnership between award-winning composers Eddie Freeman and Marta Victoria is the driving force behind the creative process at Icarus Music. 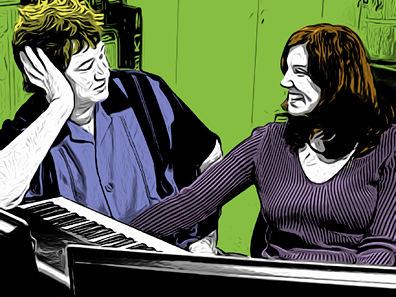 This energetic duo holds degrees in audio engineering, television, writing, music and film. Tapping on that and their thirty plus years of industry experience, they are able to quickly and intelligently compose and engineer beautiful, high-quality works for all manner of clients. When it comes to Icarus Music, these two artists pursue the same goal … to musically realize each project’s unique story and to completely satisfy and enhance every client’s vision. 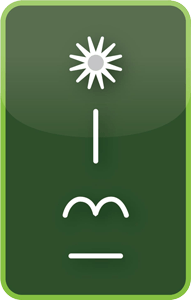 Icarus Music has composed and produced hundreds of scores for films, venues and television programming. Clients include: BBC, Discovery Channel, Disney, DreamWorks, Knowledge Adventure, Long Beach Aquarium of the Pacific, Mattel Toys, National Geographic, NOAA, PBS, Turner Broadcasting and ZDF. Learn more about Icarus music here. 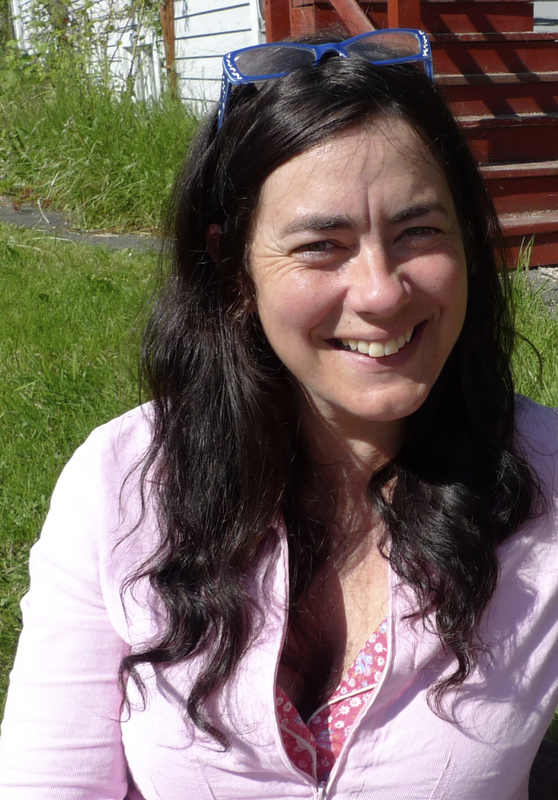 Adding to our growing team members for Headhunt Revisited is script writer for the documentary film, Elle Russ. I met Elle many years ago at a conference and was impressed by her energy – physical and mental. When we sat down, I told her the story of Caroline and Margaret. Her reaction was nothing short of astonishment that these two young women of the 1920s would take on such a dangerous journey to paint portraits. Over the years, Elle has demonstrated her belief in the Headhunt Revisited goals. A native of downtown Chicago, Elle launched her passion for writing at the world famous The Second City, Chicago where she wrote and performed sketch comedy. After moving to Los Angeles, Elle continued sketch comedy writing as a main company member at the renowned Acme Comedy Theater in Hollywood. Elle eventually broadened her writing horizons to include TV & Film and currently writes within a variety of genres: Drama, comedy, natural history, and documentary. I couldn’t be more pleased to announce that a good friend of mine, Deborah Kirk, will be writing Headhunt Revisited – the book. Deborah and I have collaborated on many travel stories, including pieces about Fiji, Papua New Guinea, the Caribbean, and Mexico. I have admired her work for years and couldn’t think of anyone better to tell Caroline’s story. 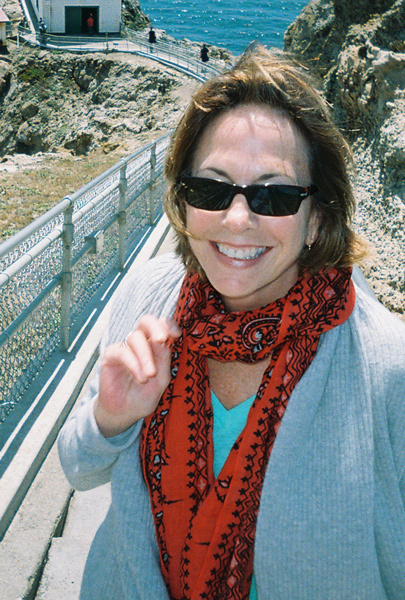 Deborah Kirk is a writer and editor based in the San Francisco Bay Area. She is currently the Editorial Director of Diablo Custom Publishing (DCP), which produces magazines for universities, museums, and many other clients. She has been a senior editor at Scuba Diving magazine, Harper’s Bazaar, and Elle, and has written for Travel and Leisure, Rolling Stone, Interview, and many other publications. Deborah has edited books for Rizzoli and the Smithsonian Institution, and has launched and edited Spanish-language magazines in Panama and the Dominican Republic. Deborah is excited to be contributing to the Mytinger project, which reflects many of her wide-ranging interests: art, exploration, Papua New Guinean culture, biography, and literature. Deborah recently visited Caroline’s home in Monterey and the Monterey Museum of Art to review Caroline’s scrapbooks and familiarize herself with Caroline’s story. Her research has also led to a number of letters that Caroline had written to family members and the discovery of newspaper articles on file at the Cleveland Museum of Art! I had the pleasure of seeing Jeffry Feeger, a contemporary artist from Papua New Guinea, perform live at Feather in New York this July. It also gave me the opportunity to interview him about the collaboration of Headhunt Revisited and his work in Art Stret Gallery’s “One World – Two Visions” exhibition. In his own words, Jeffry shares why he believes bringing Caroline’s paintings back into public view is important and how he sees the connection to his beautiful portraits. 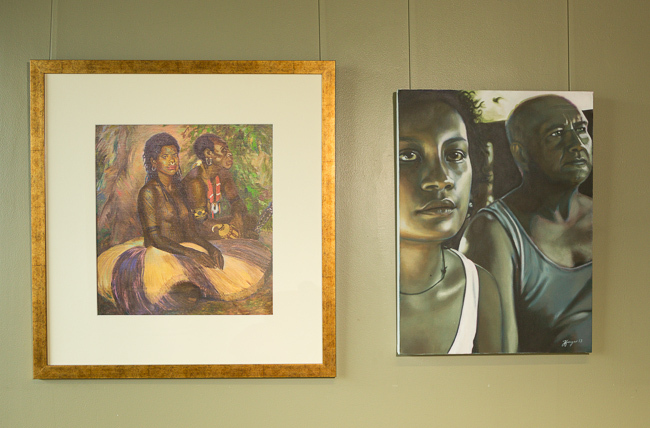 There are marked differences between Jeffry’s work and Caroline’s – a span of almost 100 years, gender difference and most significant, Caroline was a white American and Jeffry is Papua New Guinean. What they share though, their dedication to documenting the unique culture, creates a conversation that defines time. How relevant to contemporary Papua New Guinea do you feel the cultural evolution illustrated by the way both artists capture their “heads” is? Do you think the comparison will have historical significance in the future? 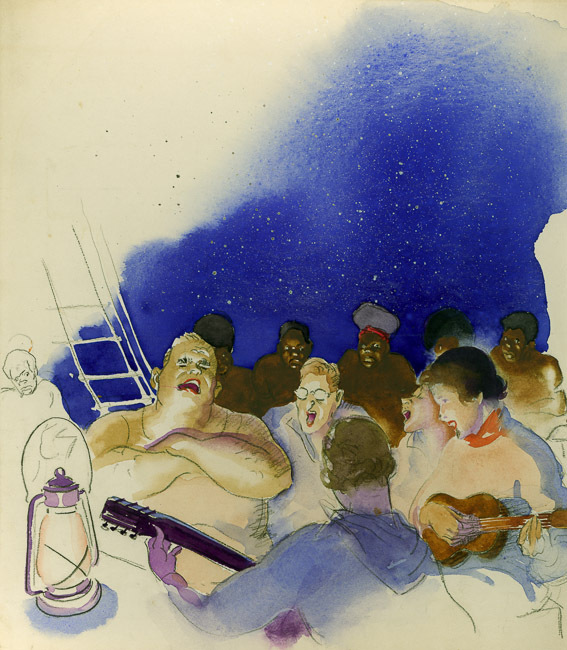 Caroline Mytinger, an adventurous artist who traveled to Melanesia to paint the portraits of the indigenous culture of the 1920’s. Caroline returned to the U.S. in 1930 to have her first exhibition in New York of 25 stunning oils. Although there were more exhibition venues for the following 5 years, the Great Depression took its toll on the ability to tell her story. So it has also been with Headhunt Revisited, the years of the Great Recession forced me to put the project on hold. I am happy to share with you that Headhunt Revisited has new life and new developments! Jeffry at his fundraiser for the “Feather” musical in Port Moresby. “One World – Two Visions” is the collaboration with Jeffry Feeger, a Papua New Guinean artist that will give a voice to talented contemporary artists of the remarkable country. 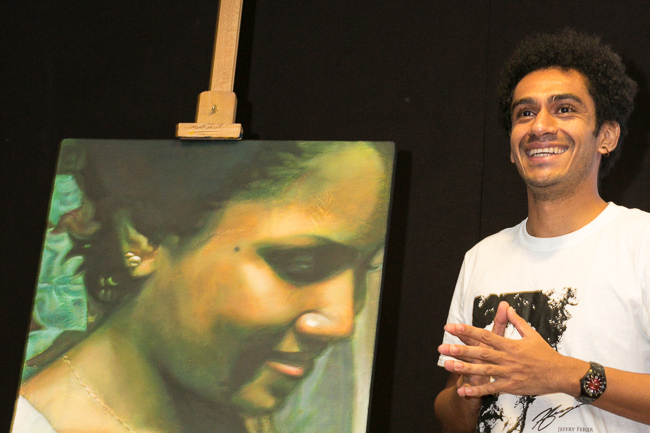 So far, Jeffry has created 4 acrylic on canvas pieces that were inspired by Caroline. You can view all 4 pairings here on the Headhunt Revisited site. In “Top Town Friends” this couple run a transit guest house at top town area Alotau, Milne Bay. The man originates from Samarai Island – where Caroline’s painting was done in 1929. He offers tours of the surrounding islands on his boat. 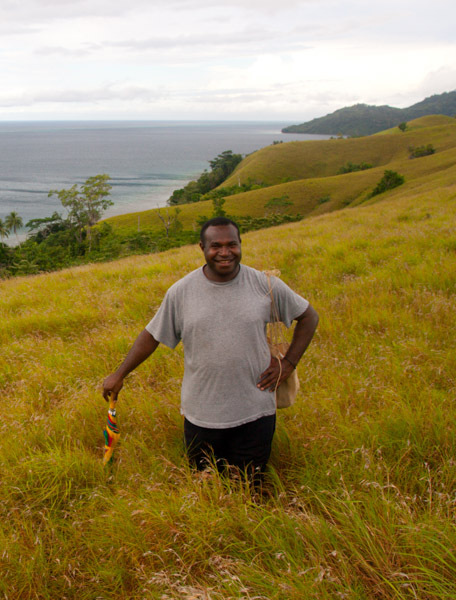 He is well recognized for his support of the local tourism industry and for his knowledge of the history and stories that make up Milne Bay. On July 11th, I will be traveling to New York to see Jeffry Feeger perform at Feather, a new musical fusing art, music and film. Please join me in the newest leg of Headhunt Revisited journey and “Like” the Facebook page. I will be sharing updates on the progress of the post-production of the documentary film, book and exhibition.